We’ve encountered a lot of fences and barriers, and I think every single one of them is ugly. We’ve met a lot of deadfall and blockages, and I’ve never enjoyed hiking around them. We’ve seen trash, abuse, drainage pipes, sewage, seaweed, muck, carcasses galore, and god-knows-what-this-or-that-was, and I’ve never thought, “we’ll that’s pretty”. But, while sifting through hundreds of photos from the past ten years, there have been some that caught my eye for being tragically beautiful, for one reason or another. 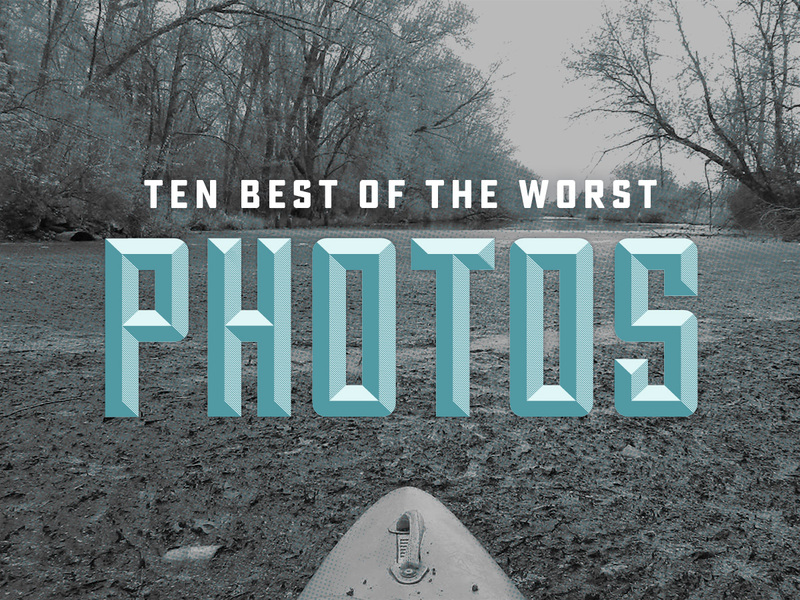 By “Best of the Worst”, I’m talking about the best photos taken in the worst (potentially worst, or uncomfortable) situations. My favorites are usually those caught right at that moment – ya know, where you or your beloved are stuck in branches or barbs or brambles or all three. It always makes me smile, because someone actually thought to take a picture to remember just how awful that moment was or was about to be. That, to me, is humor at its finest. Anyway, let’s celebrate the ten “worst” photos. One of the aforementioned decisive-moments. It doesn’t get much uglier and anxiety-inducing than a death-gate stretched far across a river (leaving no options to exit, especially in high water – yeesh). Of course, there’s alway the “iron death-gate”, one that doesn’t neccessarily sneak up on anyone but is especially heartbreaking after a long and questionable run on Six Mile Creek. There are blooms, scum, muck, mud, and then there’s this. The self-described “Michelangelo moment of handing off the handsaw” gets me uneasy just looking at how brave and reckless two men can be to help other paddlers. God bless ’em. Having encountered a few last-minute wires, I know that even in slow-current being this close to this fence for a photo-op offering no clear way through, is anxiety-inducing at its finest. Sadly, this is just reality some weekends. Here’s a sad picture of what many “beautiful” portages look like. One we run into way too often. If you think this is about the potential deadfall, please look again. Hint: it’s about the dumper.